It has long been said that playing music for your unborn baby is beneficial and one that I wanted to offer both of my girls. When I was pregnant I surrounded myself with classical music but due to the lack of a comfortable music device and time, I didn’t offer my girls the music lessons I wish I would have! Actually taking the time to do this daily can be quite the chore, especially if your a multi-tasking mommy like me! Think about it…you have to be still for quite some time, place a pair of uncomfortable headphones on your belly and wait! I can barely sit still long enough to eat, let alone setting aside 1 to 2 hours a day for prenatal music lessons! 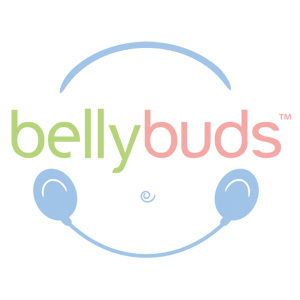 Well the introduction of bellybuds has changed things for expecting moms and their unborn babies, making in utero music lessons convenient and effortless! If only bellybuds had existed when I was pregnant with my girls! 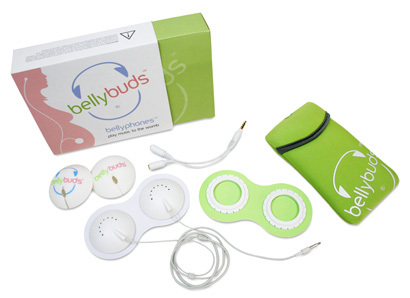 Bellybuds are wearable speakers for moms to be who want to play music for thier developing child within the womb! bellybuds plug into any MP3 player, Iphone, etc. and gently adhere to mom’s growing belly. Suddenly, you have transformed your MP3 player into a tool for parents who want to start bonding with their baby while still in utero. Bellybuds are sold with everything you’ll need to get started! All you need to provide is a music device. bellybuds are designed to plug right into your music device and their ready for use. The adhesive rings keep the speakers comfortably attached to your belly and are medical grade, skin safe and don’t leave any residue once removed. The adhesive rings will last for up to 20 to 30 uses with proper care and replacement rings are available for purchase. Buddons are also included and are fashionable pop-on covers for your bellybuds. They come in multiple colors and add a little bit of fashion if your bellybuds are going to be showing! buddons also act as a sound barrier between the sound coming from the bellybuds and the outside world. bellybuds are designed to be descreet if needed and fashionable if you want to show them off. Bellybuds speakers have a set maximum volume that has been determined by clinical research to be safe for unborn babies and is a lower volume than mom’s beating heart, for reference. To sum it up, bellybuds are portable, lightweight convenient and most importantly safe! bellybuds would make an amazing baby shower gift and one I wouldn’t hesitate to purchase for any of my pregnant mama friends! To learn more about bellybuds, benefits including current research and to buy your very own bellybuds deluxe package just visit www.bellybuds.com! The Deluxe Package is available for purchase for just $49.95 w/Free Shipping! One lucky “Deal”ectible Mommies reader will win a bellybuds Deluxe package! Just visit bellybuds and tell me something you found! It could be an additional product, something you found interesting, anything! But please tell me something other than “I would like to win these”! Win a bellybuds deluxe package @dealectiblemom! The boring stuff: Open to residents of the US only! Giveaway will end on April 15th at Midnight! Winner will be chosen using random.org! A big thank you to Team Mom and bellybuds for allowing us to offer such a great giveaway! I also found the bellybuds™ buddons which are pop-on covers for bellyphones ~ too cute! I learned that researchers have found that 34-week-old fetuses were able to store information and retrieve it four weeks later! How cool is that!